Inspired by the 1950's, the Clubmaster frame is a classic. Our Baobab pays tribute to this iconic frame. The Baobab Tree, common to mainland Africa is also known as "The Tree Of Life." 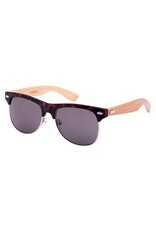 With its sleek lines and retro look you will want our Baobab sunglass to be the "Sunglass Of Your Life"!